He said, "Too bad, better bite the bullet hard, son." This alternate recording of "Soul Suckin Jerk" can be found on the "Loser" single. Carl Stephenson, who collaborated with Beck on the Mellow Gold version of "Jerk," had nothing to do with this one. 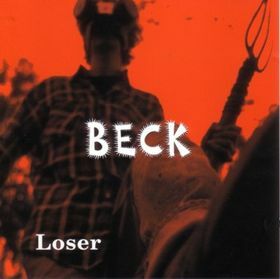 It was recorded with Tom Grimley at Poop Alley, where Beck did a number of songs from Stereopathetic Soulmanure as well. I am not sure which version first. I would kind of guess this one did since it is a "reject" though. Regardless, this "reject" version is different enough to be considered separately. Lyrically, it's pretty much identical, except the two verses have switched order for no reason. There are also some entertaining ad-libs in the middle ("Rockin' the town like a moldy crouton!"). Musically, this has a more minimalistic sound, especially when compared with Stephenson's funky layers of sound. The drumming is excellent, and the bassline grooves. The whole tempo is slower, giving the song more of a dreamy quality. The good fun comes at the end, after the second verse, where a bass solo begins the long outro. A cool keyboard jam joins in, and then some saxophones! The whole thing is the closest to jazz Beck has come on any recording. This is one of the tracks on the "Loser" single (along with "Corvette Bummer" and "Fume") that is credited as having been recorded in the year 19666. Someone's sense of time is wacked... the single also says "Loser" was recorded in 1982 and "Alcohol" in 1988!